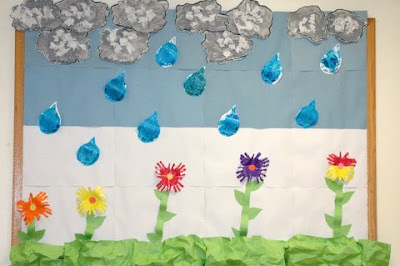 This week we talked about April showers and how they bring May flowers. On Day One we observed the rain clouds and made our own clouds by mixing white paint, black paint and glue. On Day Two we observed the rain drops and made rain with paint and glitter. On Day Three we talked about how flowers need the rain and made our own beautiful flowers out of our hands. These projects exposed the children to pre-science concepts, and allowed them to express themselves creatively. And, it was also a lot of fun!